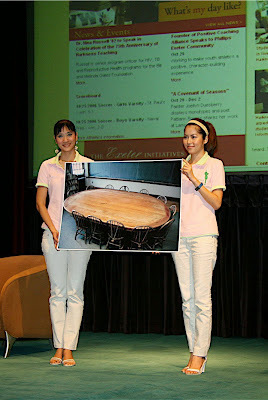 The Exeter Association of Thailand recently gave the school a Harkness table crafted from plantation-grown teak wood. instead of the usual oak. The table and chairs were presented to the Academy as a gift from the Exeter Association of Thailand in honor of Exeter’s recent 75th Harkness anniversary. They worked closely with the Academy and association members to bring the idea to fruition. The table and chairs will serve as a reminder of Exeter’s mission to attract youth from every quarter and the school’s connections to Thailand, which date back nearly 100 year s. That history came alive last year when Prasong Sukhum ’49—son of Phra Bisal Sukhumvit ’19, one of the Academy’s first Thai students—hosted visitors from the Academy and reminisced about his own first trip to Exeter, a harrowing two month journey by sea. In recent years, the Exeter Association of Thailand’s membership has expanded to over 100 alumni, parents and friends. Under the local leadership, the association hosts events, supports parents with children attending or hoping to attend Exeter.